A killer freed after just three years for killing a takeaway driver admitted battering a woman and carrying out a knife robbery in the city. John Reid, 23, repeatedly punched the woman after she confronted him over a motorbike that she had seen on Facebook was stolen. 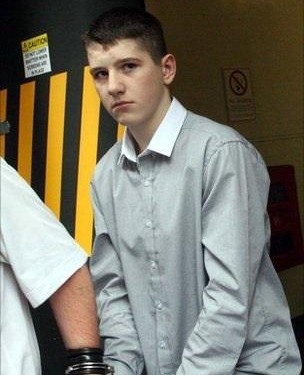 The thug and pal Michael Roberts, 22, also nicked £250 from victim Michael Glancy at his flat in Gibson Terrace. Reid’s violent attacks come seven years after he was locked up for killing Simon San, 40. Yesterday at The High Court in Glasgow Reid admitted to striking the woman twice after she got out of her car to confront him over the bike he was revving in Muirhouse. The pair also forced their way into Michael’s pad with a four-inch blade after he withdrew cash from an ATM. Roberts waved the weapon shouting “Where’s your money? The £250 was swiped from a worktop and Reid raided cupboards and drawers before they left. But cops nailed them using footage from CCTV. Reid admitted attacking the woman and resetting a motor bike in March. He and Roberts also admitted robbing Glancy eight days later. Judge Lord Burns deferred sentence until next month. Reid was 16 when he killed Simon with a single punch in 2010. He was among a group of youths who attacked him outside his family’s Yong Hua Garden Chinese takeaway in Lochend. Simon, who was of Vietnamese origin and came to Scotland age 12, suffered fatal head injuries and died the following day. Reid was convicted of culpable homicide and sentenced to five years detention, but only served three years.